Popular biographer Goldsmith (Other Powers, 1996, etc.) pens a sharp, sprightly, refreshing portrait of the brilliant, melancholic scientist, affording a sensible look into her head and into the body of her work. 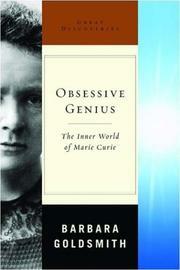 Forget the myths surrounding Marie Curie (1867–1934), says the author, and consider her on merits alone. Are they not wowing? First woman with a degree in physics from the Sorbonne, first female professor at the school, first woman to win not one but two Nobel Prizes, first woman to be elected to the French Academy of Medicine. In a world of vicious, institutionalized sexism, Curie was as “rare as a unicorn.” Nothing came easy, notes Goldsmith. Her father drove her hard down the intellectual path. Her husband, brick though he was in other ways, left the household to her alone. She was plagued by recurrent depressions. Money problems hampered her research, and her research probably killed her. Goldsmith does her best to set right some of the discrepancies between history and myth. Curie, for instance, did not toil alone: “ . . . in this journey of discovery, Marie and Pierre were equally involved . . . Pierre took over the physics . . . Marie acted essentially as a chemist.” She was, however, the one who sparked the pursuit into the mysteries of radium. The author also acknowledges the tangle and messiness of her subject’s life. Curie took a governess’s job to put her sister through the Sorbonne. She had her home stoned after the disclosure of her affair with a married man and brushed off the tar-and-feathering to accept her second Nobel that same year. She exposed her daughter to radium, knowing its deleterious effects—chronic ill health and fingers like concrete might have been a clue. Goldsmith unconvincingly suggests an answer can be found in willfully ignorant “love” for radium: “my child,” Curie called it.